For Alaska and Canada, as of today, an unprecedented 12,000,000 acres of forest and tundra overlying the rapidly thawing and human greenhouse gas emissions warmed permafrost has burned — going up in vast, billowing clouds of smoke. This smoke has spread out, caught up in the meandering Jet Stream, and is now visible in far-flung locations by both ground and satellite observation. In addition to painting skies across Canada, Alaska and the Western and Central US milky white, upper level smoke from the fires has crossed Greenland and the North Atlantic, entered the Central Arctic Ocean and is now visible as a hazy pall over web cameras observing North Pole melt. In the above image we can see this smoke haze painting the sky a brown-gray pallor in the NEOPAWS North Pole web cam image. Beneath these skies, the sea ice surface has melted to the point that the marker strakes are wobbling off kilter and that substantial melt ponds are cutting deep furrows into the polar ice. The hazy hew of skies in this image together with an overhead cirrus cloud cover tinted brown indicates that smoke particles have been lofted into the Jet Stream level. 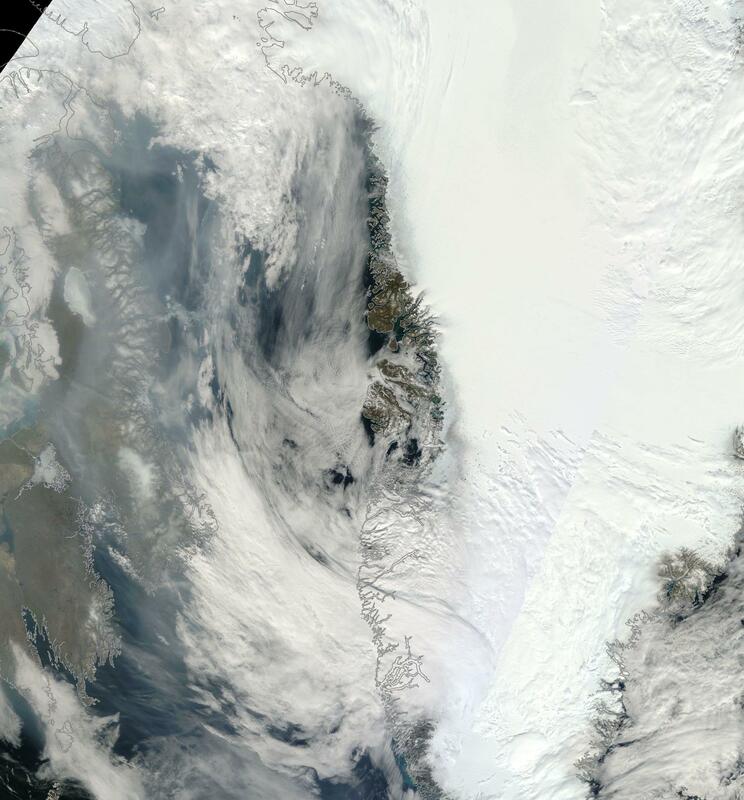 By Sunday, this smoke had become entrained in the draw between a cyclonic circulation over the Laptev Sea and an anticyclone formation on the Greenland side of the Arctic. It’s a dipole pattern that has now lasted for more than a week. One that is regarded as rather unhealthy for late season sea ice totals. Note the herring-bone formation of darkened upper level clouds drawn through the dipole and running diagonally from upper left frame to lower right of the second image. The pole in image 2 is also in the lower right frame. Lofting large amounts of brown carbon into the Jet Stream level of the atmosphere is an amplifying feedback to human-caused warming. 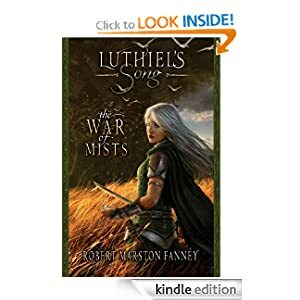 One occurring in addition to the added rate of carbon release generated by these wildfires as well as to a transient negative feedback coming from generating thick, low level clouds, that block out sunlight. High level clouds alone aid in the heating of the Earth — allowing visible sunlight to penetrate while trapping long rave radiation rebounding from the Earth’s surface. Painting these clouds dark through brown carbon smoke particulate emission into the upper atmosphere provides an added heat kick by further lowering cloud albedo and by re-radiating an overall greater portion of the transient heat. As a final insult, the brown carbon aloft eventually precipitates down to the surface. When such precipitation lands on ice sheets and northern hemisphere snow cover, it darkens the snow and enhances melt. A kind of ominous global warming fallout. 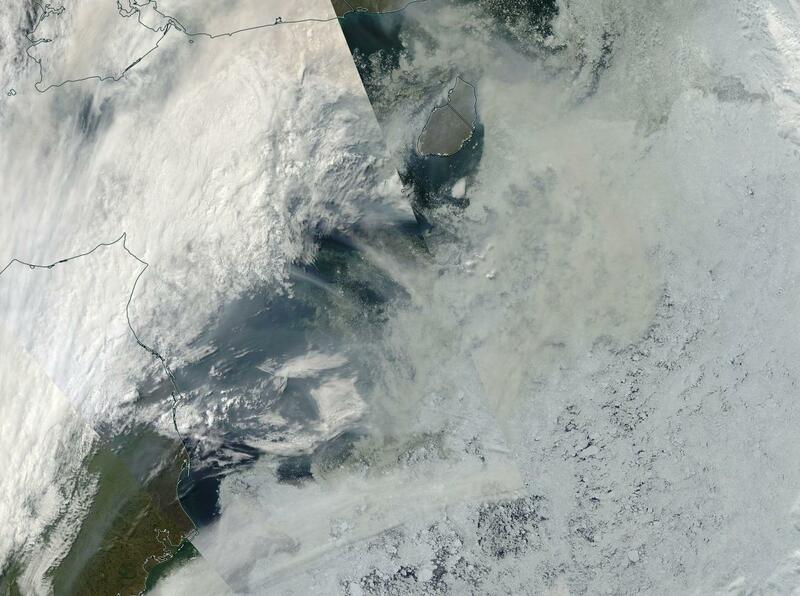 Smokey haze over North Pole melt ponds — one albedo reducing process being reinforced by the other. The Russian side of the Arctic is heating up. A high amplitude ridge in the Jet Stream is forecast to develop atop the Yamal region of Russia, expand northward over the Kara and Laptev seas, inject a plume of anomalously warm air over the polar region, and then proceed on along the Arctic Ocean shores of Siberia. Beneath this ridge, temperatures over the Arctic Ocean will spike to +1 to +4 C above average while temperatures over land will hit extreme +20 C and higher anomalies. Arctic Ocean zones are forecast to see temperatures climb above freezing for much of the 80 degree North Latitude zone. 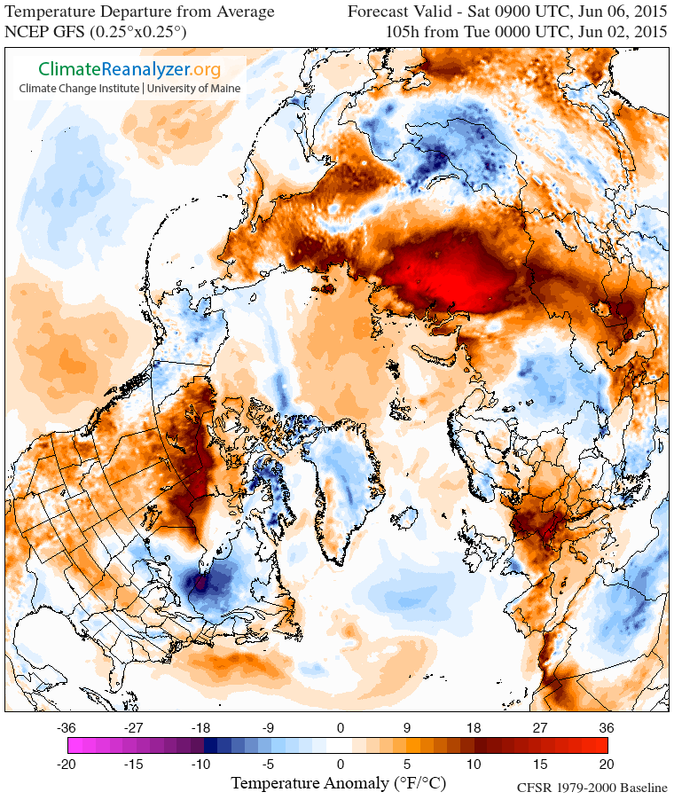 Over Siberia, land-based temperatures are predicted to range from the 40s and 50s along the Arctic Ocean boundary and climb to the 60s to 80s in regions just inland. Sparse remaining snow cover in Northeast Siberia along the East Siberian Arctic Shelf coastal zone is expected to be pretty much wiped out. One foot average snow cover along the shores of the Laptev and Kara seas is also expected to melt. And a broad section of remaining snow upon the sea ice is predicted to retreat away from the North Polar region — receding back toward the final haven near Greenland. Snow is important for spring and summer-time Arctic temperature moderation due to the fact that it provides insulation to sea ice and permafrost as well as serving as a reflective, high-albedo surface that bounces back some of the incoming heat from the 24-hour seasonal Arctic sun. 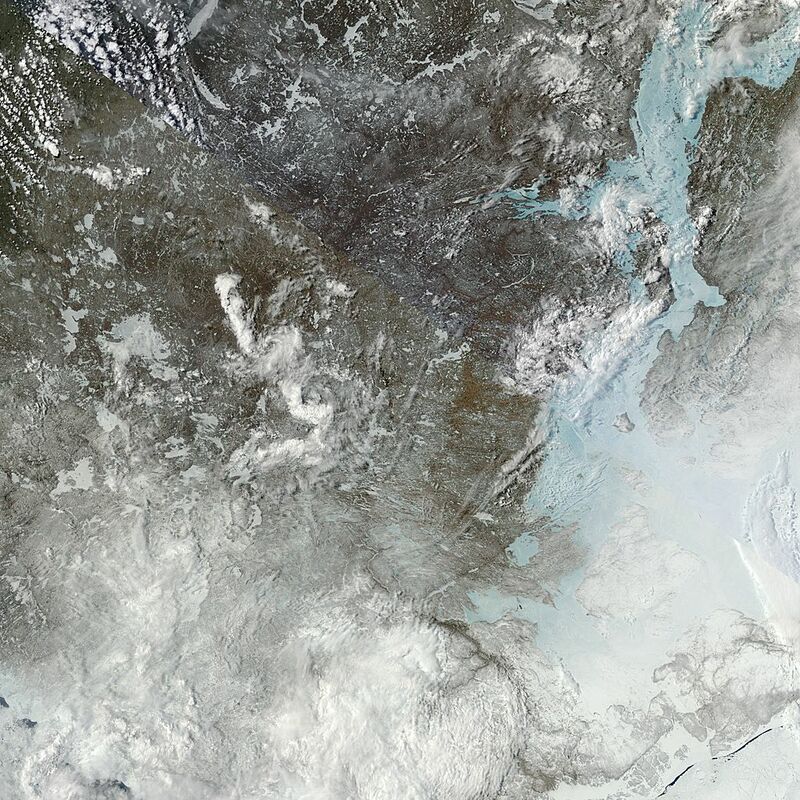 Snow melt, on the other hand, serves to form albedo-reducing melt ponds over the Arctic Ocean sea ice during summer. A critical factor in late season melt forecasting in which more June melt ponds tend to mean lower sea ice totals by end season. In addition, snow melt fills permafrost zone rivers with above-freezing waters that then flow into the Arctic Ocean — providing yet another heat forcing to the sea ice. This weekly trend and forecast is consistent with an ongoing tendency during 2015 for strong ridge formation and warm air slot development over both Alaska and the Yamal region of Russia. The high amplitude ridges also likely have teleconnections with larger weather patterns such as El Nino in the Pacific, the warm water pool (hot blob) in the Northeast Pacific, and record low sea ice extents continuing for most of Northern Hemisphere Spring. Observations that are also consistent with the predictions made by Dr. Jennifer Francis that are a direct upshot of polar amplification set off by human-caused warming of the global climate system. It’s worth noting that many of these factors are self reinforcing. 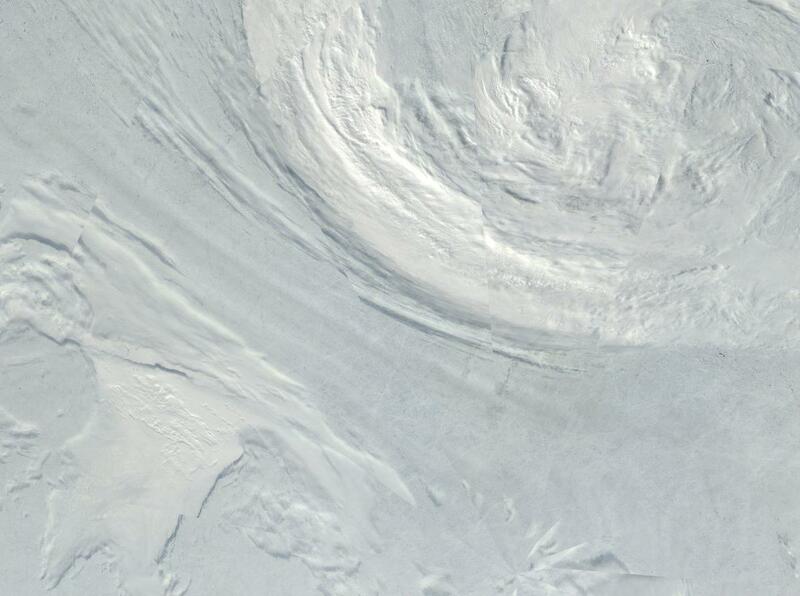 For example, more sea ice melt results in higher amplitude wave formation in the Jet Stream. 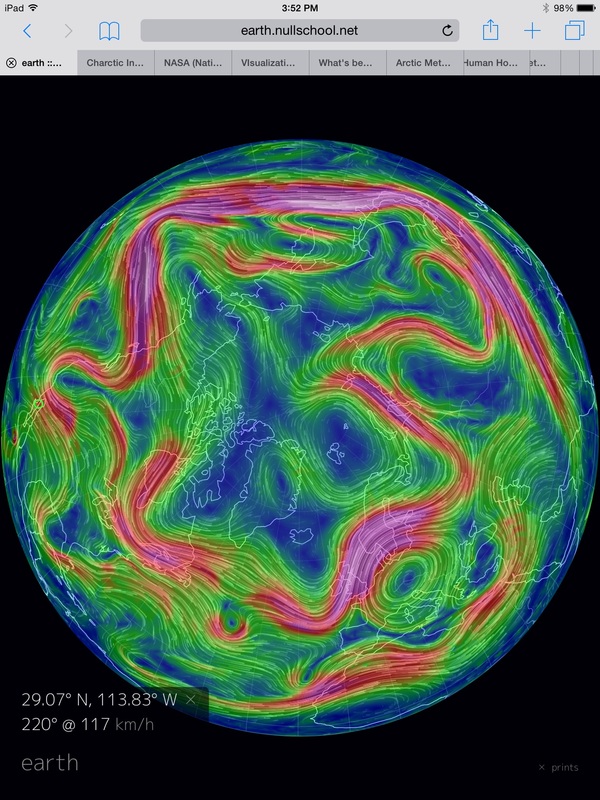 Higher amplitude wave formation in the Jet Stream transports more warmth to the Arctic environment, resulting in more sea ice and snow melt which in turn weakens the Jet Stream further. A longer-term amplifying feedback of Arctic carbon release may also be in play (hinted at by an overburden of both CO2 and methane in the local Arctic atmosphere), which would also contribute to the conditions we now observe. A final feedback, this one somewhat negative, occurs as a result of Greenland Ice Sheet (GIS) melt. Large cold, freshwater outflows from GIS into the North Atlantic result in localized cooling in that region. This feedback (also related to AMO weakening) enhances trough formation throughout the North Atlantic region adjacent to Greenland and the Canadian Archipelago. A final potential teleconnection to the ridges we see forming over both Yamal and the Alaska/Northwest Territory zone. According to our best understanding of paleoclimate, at current greenhouse gas levels of 402 parts per million CO2 and 481 parts per million CO2e, the Greenland Ice Sheet eventually melts out entirely. It’s a level of atmospheric heat forcing we’ve already set in place, a level that keeps rising at a rate of about 2.2 parts per million CO2 and 3 parts per million CO2e each and every year due to our ongoing and reckless carbon emissions. And it’s a level that is already starting to receive substantial additions from destabilizing permafrost carbon together with likely increasing releases from sea bed methane stores. In this, rather stark, geological, climatological and physical context, we ask the question — is it possible for us to stop a wholesale collapse of Greenland’s ice? And we wonder, how long can the ice sheet last as human greenhouse gas forcings together with ongoing releases from some of Earth’s largest carbon stores continue to rise? For ultimately, our ability or inability to rapidly mitigate and then draw down extreme levels of atmospheric greenhouse gasses will provide an answer these key questions. And whether we realize it or not, we are already in a race against a growing Earth Systems response that may eventually overwhelm our efforts, if we continue to delay for too long. But there’s a lot of inertia in the ice. It represents aeons and aeons of ancient cold locked in great, mountain-high blocks. And its eventual release, which is likely to continue to ramp higher and higher this century, is bound to result in a temporary and weather-wrecking outrush of that cold causing dramatic swings in temperature and climate states to be the rule of the day for Greenland as time moves forward. So we should not expect any melt to follow a neat or smooth trend, but to instead include large variations along an incline toward greater losses. In short, we’ve likely locked in centuries of great instability and variability during which the great ice sheets are softened up and eventually wither away. In the context of the past two decades, the 2014 summer melt has trended well above the 30 year average in both melt extent and surface mass losses. Though somewhat behind melt during 2012, 2014 may rank in the top 10 melt years with continued strong melt in various regions and an overall substantial loss of ice mass. Overall, 2014 showed four melt spikes above 35% melt coverage with three spikes nearing the 40% melt extent coverage mark. By contrast, 2013 only showed two such melt spikes, though the later spike was slightly more intense than those seen during 2014. 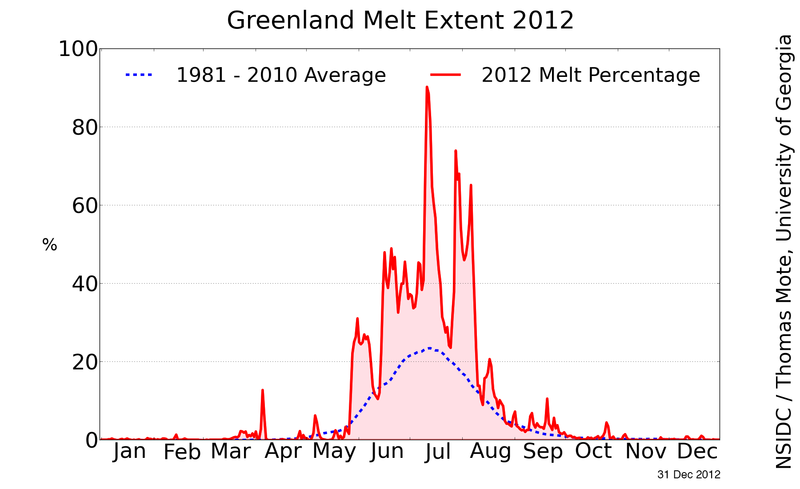 2012’s 150 year melt, on the other hand, showed melt extents ranging above 40 percent from mid June to early August with two spikes above 60% and one spike above 80%. 2012 was a strong record year and, on average, we’d expect to see the record jump back to lower levels after such a severe event. 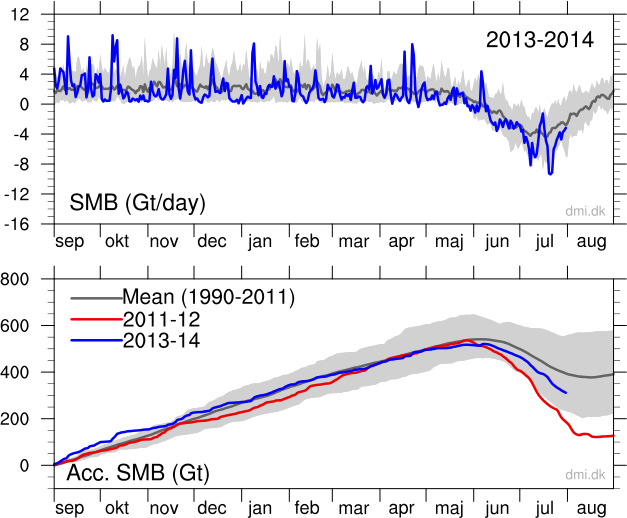 However, there’s little to indicate that either 2013 or 2014 have bucked the trend of ongoing and increasing surface melt over Greenland. To the contrary, that trend is now well established with yearly surface mass losses now taking place during all but one of the last 13 years. And there is every indication that 2014 will be a continuation of this trend. While surface measures are a good measure of melt on the top of the ice sheet, it doesn’t give much of an idea of what’s happening below the first few feet. There, during recent years, sub surface melt lakes have been forming even as warming ocean waters have eaten away at the ice sheet’s base. And since more than 90% of human-caused warming ends up in the world’s oceans even as many of Greenland’s glaciers plunge hundreds of feet into these warming waters, one might expect an additional significant melt to be coming from the ocean-contacting ice faces. 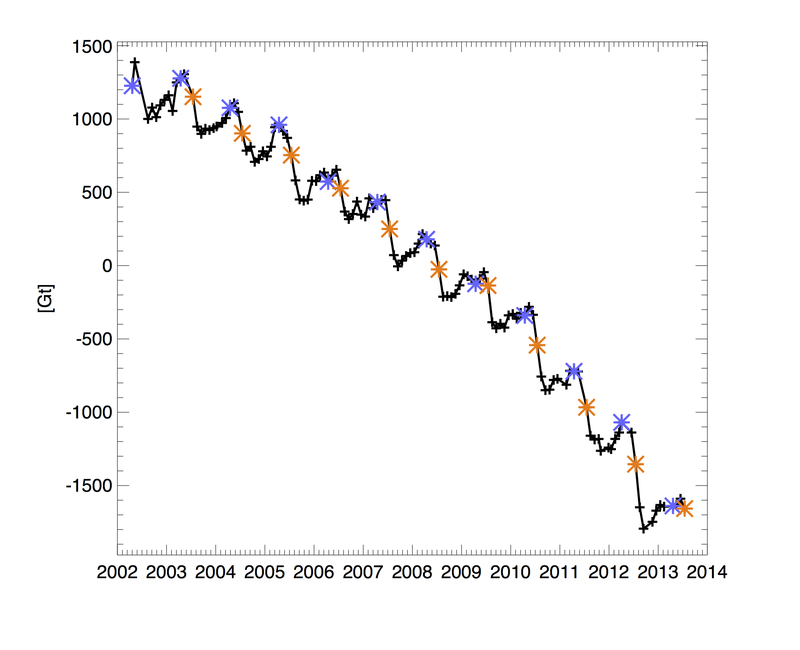 It is this ongoing overall mass loss that tells the ice sheet’s full tale. One that now includes an ever-increasing number of destabilized glaciers speeding more and more rapidly seaward. Yesterday, 40% of the surface of Greenland melted. 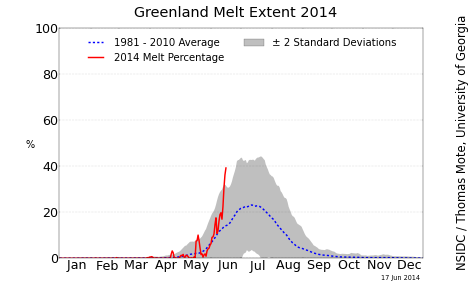 It was still mid-June, yet a month before melt values typically peak. But a persistent high pressure system over Greenland, a rapidly melting Baffin Bay and warm winds riding up the west coast were enough to spur a surface melting event that shoved melt coverage firmly above the two standard deviation threshold and into record range. 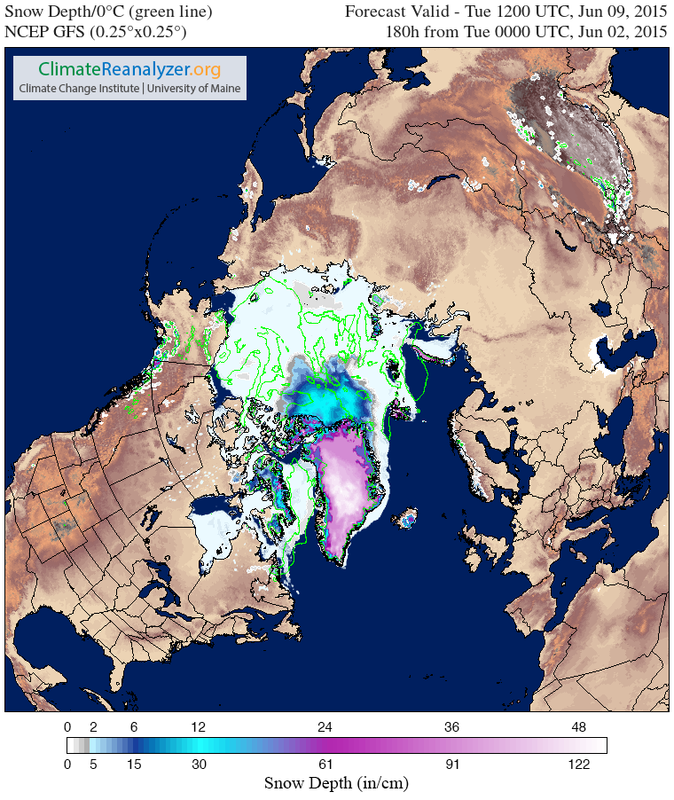 Temperatures along the west coast of Greenland and on through the southern ice-covered tip ranged between 30 and 55 degrees Fahrenheit, while 30-43 degree readings surrounded much of the periphery. Warm winds and rain to mixed precipitation accompanied a moisture-laden storm emerging from Baffin Bay and passing over the western ice sheet to add further and extreme early season melt pressure. Melt ponds add heat amplification to the glacier surface by reducing albedo even as they provide melt drainage to the glacial base. Floods of water from melt ponds add to glacier speed and buoyancy by reducing friction at a moving glacier’s base and by flooding geographic low points beneath the glacier. Melt ponds also reduce overall ice sheet integrity by permeating the ice with holes and fractures. 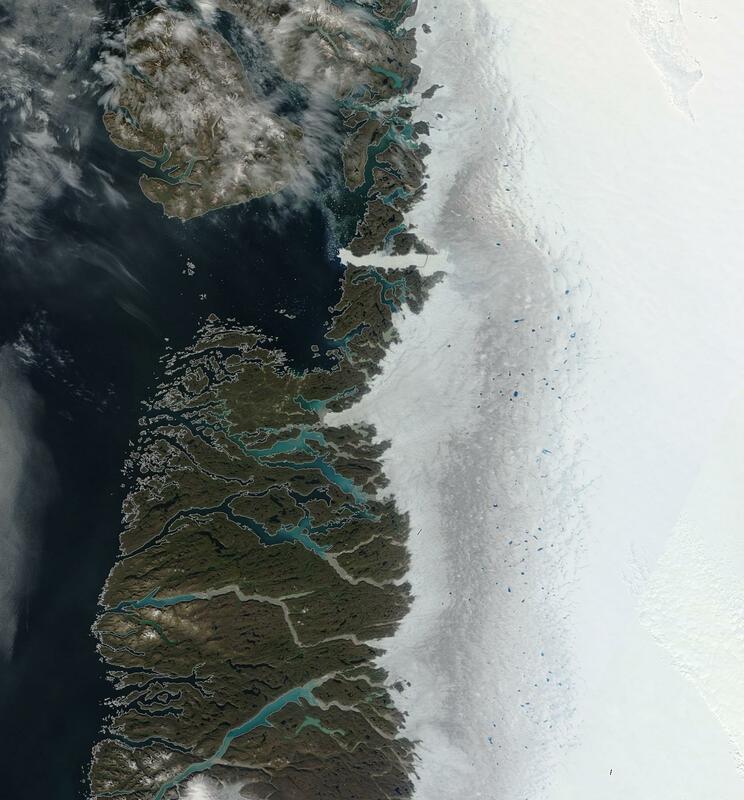 The Jacobshavn Glacier in the satellite shot above is Greenland’s fastest. It is now involved in a very rapid rush toward the ocean at a rate of 46 meters per day. A rush that has been facilitated in recent years by a major proliferation of melt ponds during summer time. During extreme events, melt ponds can combine and over-top or break ice dams in dangerous glacial outburst floods. 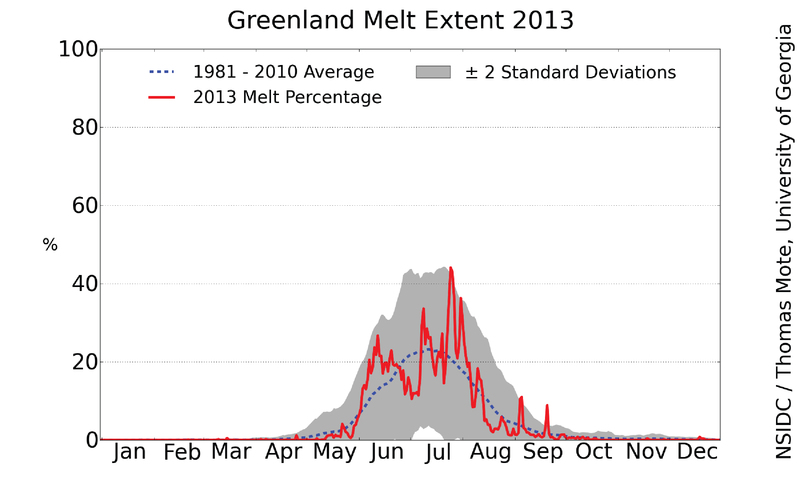 It is worth noting that Greenland melt pond proliferation has not yet reached a threshold for high risk of such events. But the now decade-long proliferation of melt ponds over the ice sheet surface during summer time remains a troubling occurrence. 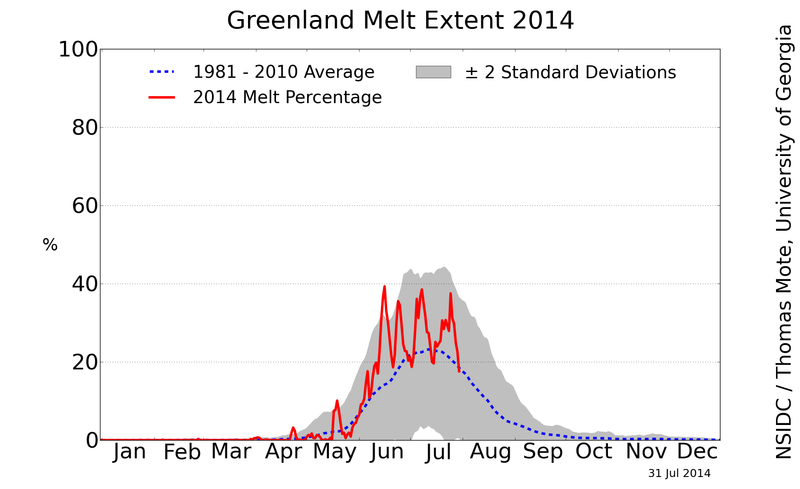 40% melt coverage in mid June is an extraordinarily high number. Last year, melt coverage peaked at 47% in late July with June values approaching the high 20s in late June. July of 2012 saw a 97% melt coverage — an event last seen about 120 years ago and one that is, unfortunately, likely to be repeated soon under current human heat forcing. It is worth noting, however, that the record year of 2012 saw Greenland melt coverages periodically exceeding 40% from mid-to-late June. Early melt and proliferation of melt ponds along with persistent high pressure systems over Greenland tend to have a compounding effect that amplifies over-all melt coverage. Low mists and clouds tend to form during such conditions, trapping heat near the ice surface even as albedo over the ice sheet falls due to wide-scale melt pond formation. Though yesterday’s melt coverage is an early challenge to melt levels seen during 2012, current conditions would have to both persist and intensify for the broad extent of melt seen during late June and through July of 2012 to show a rough repeat. That said, a 40% melt coverage on this date is a record-challenging level that bears watching. It’s been rather warm in the Canadian Arctic over the past few days. This day, especially, revealed particularly high temperatures. From the bottom edge of the Canadian Arctic Archipelago southward, 20 degree + Celsius temperatures ran through a wide region on the west side of Hudson Bay. These high temperatures are having their impact. 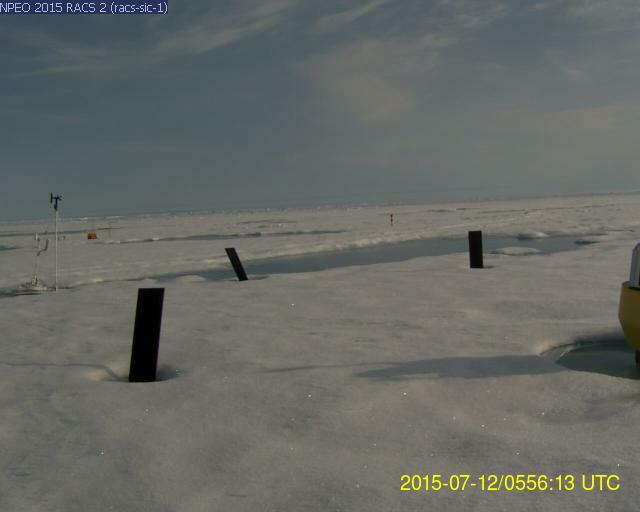 Hudson Bay itself is riddled with holes and rapidly thinning. 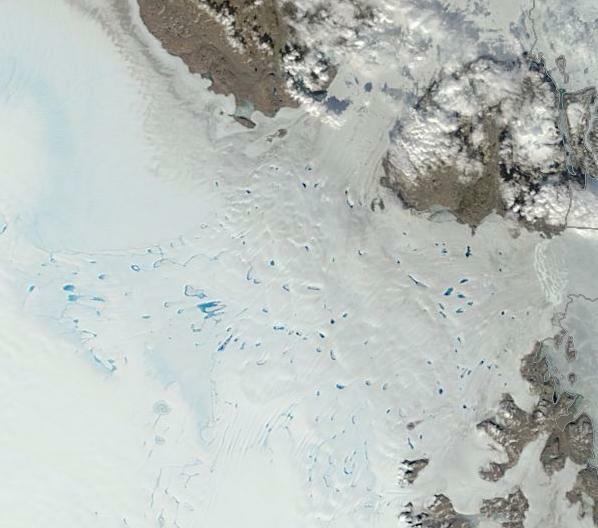 Meanwhile, a section of the Northwest Passage in the Canadian Archipelago is turning a characteristic blue color. Looking down from our satellite perch, this pale shade appears to grace the ice with a flattering color. But closer in we notice that this particular peal is a result of a multiplication of melt ponds on the ice surface. The ponds refract the light, turning them a mesmerizing shade of blue. And as these lakes increase in number to dot the ice, from far away the it appears to take on their color. This particularly brilliant display comes with an ominous note. Thin ice, vulnerable to accumulated energy from the sun (insolation) tends to melt much faster. And so it is melting faster, about three weeks to a month ahead of schedule in this particular region. Together, warm air plus insolation may be spelling out an early end to winter’s ice here. 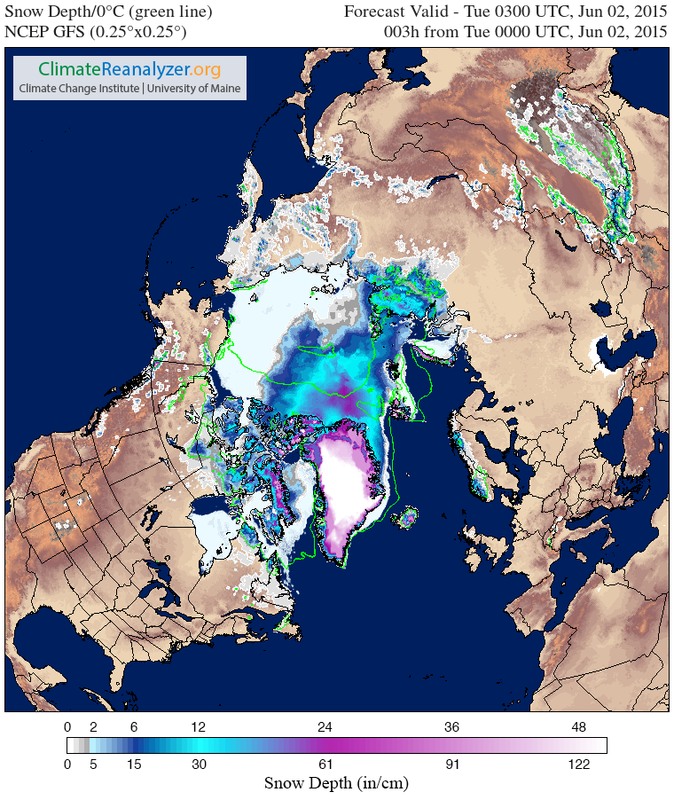 Chris Reynolds over at Dosbat and Neven over at the Arctic Ice Blog have been warning of the sea ice’s special vulnerability to insolation this year. This vulnerability is primarily due to the fact that most of the Arctic Ocean and related waterways are covered only by a thin layer of about two meters of ice. 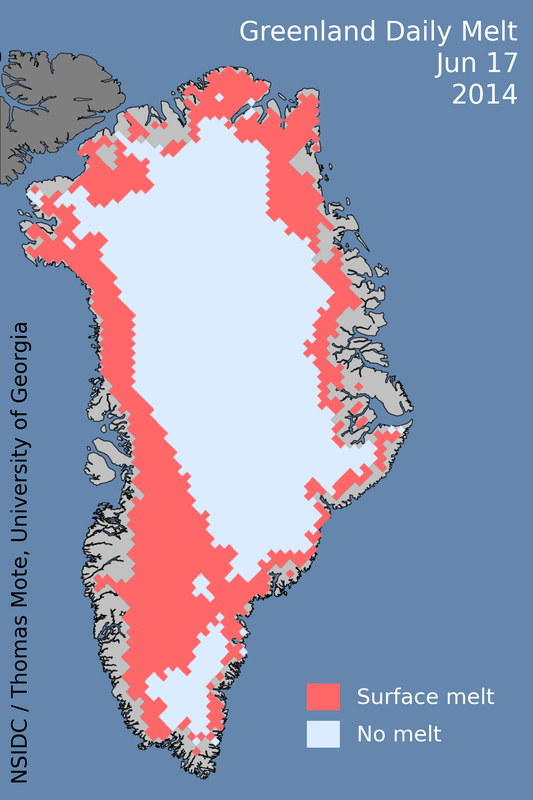 Very few regions remain where thick ice dominates. And two meter ice may well not survive the assault of the summer sun. 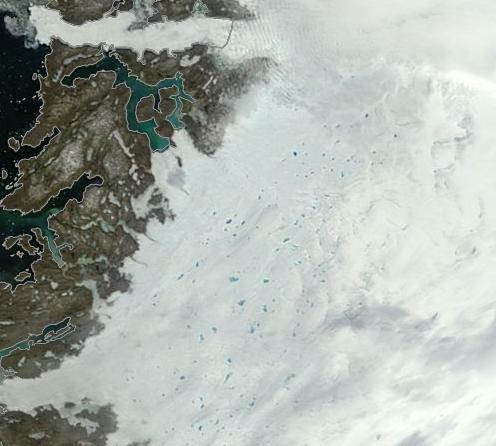 In the Central Arctic, where much of the remaining thick ice resides, the area is plagued by a powerfully churning storm. This persistent monstrosity is little more than a giant engine of heat exchange. 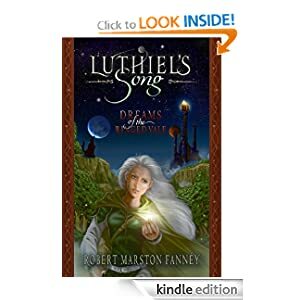 It pulls air in from the surrounding atmosphere, it feeds on heat and moisture, it flings out winds, and it even turns and churns the icy ocean beneath. Such a storm, so long ongoing, poses its own threats to the Arctic’s more vulnerable ice. But where the air is still, where there is ambient heat, and where the clouds open wide and allow the sun’s rays to plunge down upon the ice surface, insolation is king. And that force, a direct force of sunlight, appears to be spelling an early end to this so seemingly lovely stretch of pale, blue ice.